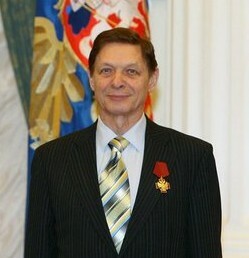 RIP Eduard Khil: Trololo Man. Eduard Khil or better known in the internet world as Mr Trololo Man, has died. He suffered a stroke last May, and went into a coma. He passed away today, June 4th 2012.
i actually performed this song at our corporate dinner event. The original website, Trololololo[. ]com that uploaded his video went black to pay a respect to his passing. You will be missed my good sir. The original video via YouTube. His most recent performance of the song.